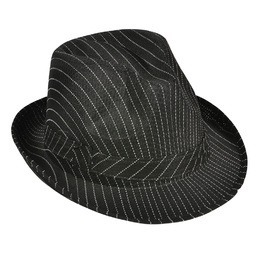 This classic and elegant hat can be worn in everyday life as it is trendy. This black pinstriped fedora hat can also be worn on special occasions such as: casino evenings, halloween parties and at dance performances. It is made of polyester and cotton. This product is black with white stripes. This costume hat is adult-sized and is not recommended for children under the age of 5 years old.